During the “dark months” Saturday night is Pizza Night at our house. I keep all the ingredients on hand (many in my freezer) so I don’t have to dash to the grocery store. I despise dashing to the grocery store. It takes about 2 1/2 hours from start to finish, although in a crisis of forgetfulness, I’ve zipped pizza out under two hours. We love the quality of the pizzas, there are endless combinations, and it has been an economical way to feed our family and have fun doing it! I shop at Costco (~ Sam’s Club) and Grocery Outlet (~ Winco) for the ingredients. I vacuum-pack the pepperoni in small portions and freeze them. The cheese I store in the freezer and get out about an hour before I need it. I break off what I need and put it back in the freezer. There is one other necessary purchase: a baking stone. You can spend $40 at a home party or you can buy one for $15 at a box store. I bake bread, pizza, scones, focaccia, and hot pockets on my stone. As you can see, it is well seasoned. The stone will make the difference in the pizza crust. You gotta have a baking stone. Stir and let mixture stand until it foams. Mix and knead the dough by hand, in food processor or electric mixer. Let dough rise in well-oiled bowl, covered with plastic wrap until doubled, 45 minutes – 1 1/2 hour. Simmer 10-15 minutes (or longer). It takes a bit of practice to get the pizza into the oven in one piece. Roll out dough into a circle. 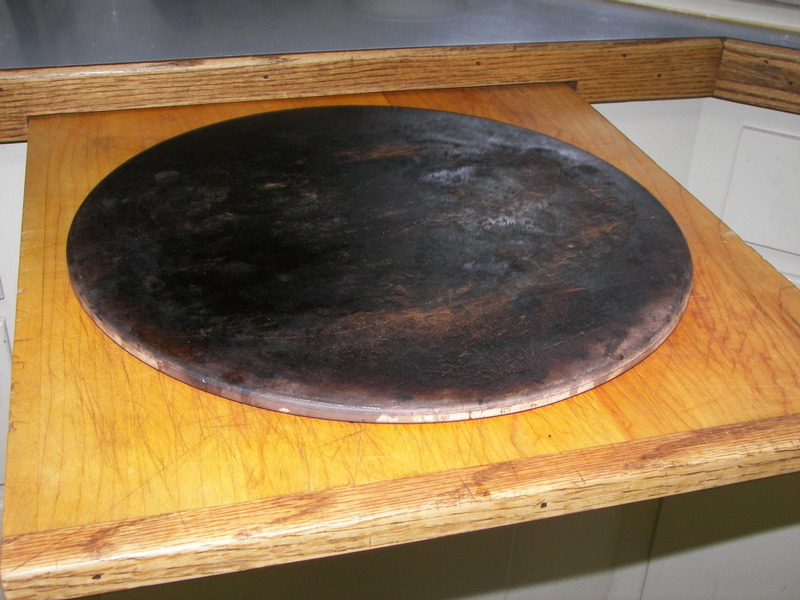 Transfer dough to flat (no lip) cookie sheet or a pizza peel (looks like a massive spanking paddle) or a flat cutting board or if you are desperate a plastic chopping sheet. Critical: sprinkle your board generously with cornmeal. This keeps the dough from sticking. You will slide the pizza into the oven. Another flat cookie sheet or plastic cutting sheet is good to persuade naughty pizzas onto the pathway of righteousness. Another hint: start by making smallish pizzas. Preheat oven and stone to 500°. Add sauce and toppings according to taste. My man likes more sauce and less cheese. Adding a sprinkling of Parmesan on top of the Mozzarella adds a little zip. Bake at 450° for 8-10 minutes. Ranch dressing for the sauce on a chicken garlic pizza. Just brush the crust with olive oil for a caramelized onion Gorgonzola pizza. The photo at the top is my son’s first attempt at making pizza. Everything in this blog post was taught to me by my brother Dan. He bought my first pizza stone, gave me a pizza peel, and made many pizzas in my oven. Thanks, bro! This entry was posted in Uncategorized and tagged food by alivingpencil. Bookmark the permalink. Oh wise woman, you have said a truth — keeping ingredients in the freezer is a must!! This list will come with me on my next trip to Sam’s Club! Everything homemade is better – better tasting, more nutritious, and more economical. That looks scrumptious!What do you eat when you dont feel like going to any trouble…. hotdogs? @hiddenart – Dana you are KILLING me! Hotdogs? What, are you feeling impish today? HOTDOGS!!!!! We haven’t had a hotdog in the house for at least ten years. I do like them at a major league baseball game or when we go to Costco. Breakfast for dinner is my favorite quickie. But I also make enough to have two meals out of most of my dinners. I can’t EVEN imagine being married to a man who wouldn’t eat leftovers. giggle… guess I got your goat, huh? No hotdogs in my house either.One of my sister’s makes the best stromboli; I am just lazy about making bread, I guess. The closest I come to homemade pizza is Boboli crust, pesto sauce, sauteed onions & peppers, feta, grated mozza. Pretty gourmet and quite pricey compared to the $9.99 Dominos. Bacon double cheeseburger is my favorite. I am hungry, and I just ate! You could take professional food photos. carol, i’m so glad to see your well-seasoned looking stone! i bought two stones last month and worried about not being able to clean them properly – i gather it must look like that our pizza-making procedure is identical – except for an interesting addition on your side – the cornmeal you use in the dough – why do you substitute? do you need an au pair? i have a lovely daughter we will feel at home. can we come and visit one day? I have two baking stones and leave them in my oven at all times (per a suggestion from Julia Child). They help in even heating and I just slide bread or pizzas right on them. We like about a third whole wheat in our dough, we’ve just become accustomed to the taste, I think.I don’t make my own sauce (I don’t cook Italian) so I open a can of regular spaghetti sauce and add a little more spice.Friday night is pizza night around here. @sonskyn – Come and welcome. I would love to have a visit from you. Perhaps I should come visit you! My aunt lives in Fishhook. I could visit my friend in Zimbabwe…if she’s still hanging on… But it would be great to have face to face talks, wouldn’t it?We use cornmeal because my husband likes it! I don’t have an au pair; I don’t need an au pair, last time I checked. But your daughter is lovely – I’ve seen a picture on your blog. you are most welcome… our current rand/dollar rate would allow you to have a great holiday! I followed a note on Deb’s blog to your lovely place, we do homemade pizza a lot too, and I love my baking stone. @mmewhinn – Welcome Mimi! It’s great to have you visit. I’m jealous of your baking stone. 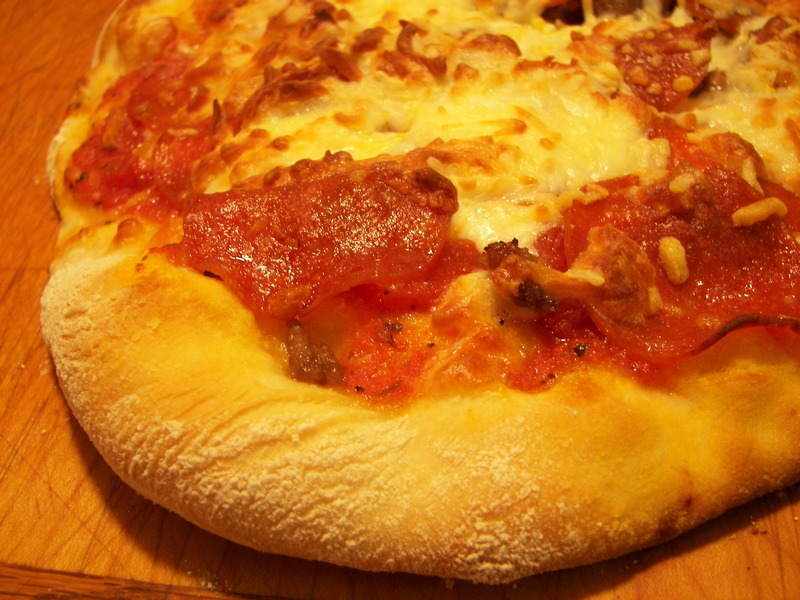 I’ve made home-made pizza every Friday for the last ten years or so. Since I discovered a crust recipe that takes olive oil and a bit of honey, no store-bought crust tastes “right” to us. Cheese is pretty expensive here so I buy mussarella in bulk (10 pounds) and grate and freeze it. Recently I saw provolone on sale and grated and froze that too. It’s pretty strong so it only takes a fourth of a cup (small handful) in addition to the mussarella to really spice up the pizza. I love it! Hi again, Carol, I just realized I spelled Mussarella cheese the Brazilian way. I forget how to speak English on occasion! @hopeinbrazil – I thought Mussarella was charming. Did it take you long to learn Portuguese? I’m assuming you’ve spoken it for years now. Hope, my pizza book gives an alternative to the baking stone: buy unglazed ceramic tile from a ceramic tile supplier. You want something slightly less than 1/2 inch thick (I’ll let you do the conversion to metric). Too thick takes too long to heat, too thin may crack from intense heat. The ceramic tiles was given as a cheaper alternative to buying the stone. The principle is to have dry, direct heat to sear the crust. Bingo! Another thought!!! My friend makes her pizza in a cast iron pot. A Dutch oven, or a skillet, perhaps? You would preheat the pot, just like the stone, but it would provide the direct heat. I don’t know what is available to you, but perhaps one of those ideas might work. Thanks for the ideas. I’ve been here 20 years and can speak Portuguese pretty well, though not as well as my dear hubby who grew up here as a missionary kid.